What’s your name, who’s your Daddy , does he look like me? I was 21 and had been living in the UK for a couple of years when I got a letter from my father in Australia. He was writing to tell me that he was very happy and that he would soon marry a local woman who he had known for a just few months. They intended to travel together exploring Continental Australia, It had been 10 years since my parents separated and I was pleased for him. I knew the woman or knew of her as she had a daughter my age that I’d partied with a few times. There was just one little issue, the woman was pregnant to another man, apparently some horrible monster of a demon Man – as we all in turn, frequently become when we are no longer desired. A few months later I travelled to Australia to be my fathers best man, his bride’s son had been born a few months before the wedding, It was revealed to me that my fathers name was inscribed on the birth certificate in the column where the child’s fathers name was supposed to go. This was considered an honourable thing to do by many of my relations that all knew my father had had a vasectomy procedure 20 years earlier. The women particularly, believed the fraud was all good. I realise now it was also a very risky as had the marriage failed he would have been ordered to pay almost 20 years of child support for a child that was not his. But it didn’t fail, For the following 19 years they were happy together and raised the boy. Then in 2011 I got a call from his wife, She told me his cancer has gotten the better of him, Hope of recovery was receding. I had just arrived at his home as an ambulance brought him home from hospital. The paperwork that arrived with him said- ‘do not resuscitate’, my father had been allowed to return home to die. For the next couple of days with the help of oxygen he was able to speak quite well and we chatted away like nothing was the matter. But a few mornings later- after a few days of discomfort from bowel cancer my fathers body, aged 68- was all that remained. He had left his wife well provided for with their home paid for and another property with a small mortgage. My Dad and his wife had been reasonably fastidious parents, always remaining in the right school zone for the boys best education opportunities. It always surprised me that they had never just been honest with the boy and told him that his real father was another man. It was always said that they would tell him- one day, when the time was right. The boy had been a brat child at times as some children with older parents can become. My father and the boy hadn’t always gotten on so well. But I always enjoyed him and did my best to bond with him as best I could considering the 21 year age gap between us. 18 months after My fathers death I got an email from my his widow that she had concerns for the boy, he had dropped out of university and had taken an interest in knives, there had been some youth stabbings in the town and she was worried he was rolling with a bad bunch and might get into trouble. I had recently become separated from my own marriage- which I had no intention to try to rescue. I travelled again to Australia and got a contract there and an apartment and settled in for a while. The boys interest in knives was real, he loved them and so do I. He was most interested the properties of steel and knife construction. 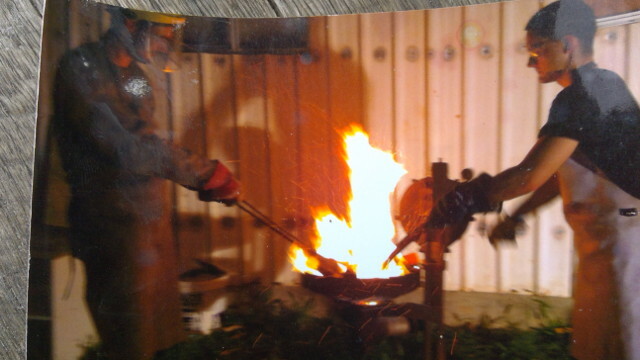 I had joined the local men’s shed and after some enquiries – a fine forge and anvil was found. The boy and his mate researched and found a couple of old buggers that had been the forgers and smith’s back in the day when everything was still in black and white and they visited them for advice. They managed to procure all the safety gear and tools necessary for experiments to begin. They cooked up lead then zinc then brass and bronze then got to work hammering and tempering steel, toiling away in the tropical heat hammer and tongs, in the evenings we would pull out a couple of shovels for bbq plates, go foraging in the gardens for herbs and salad and we’d pull apart some cheapo sausages fo a potluck Aussie mess, we could hardly taste the dirt. Perhaps not to Paul Hogan’s standard, but a fine knife was the boys creation to be proud of. He got stuck in at the shed which was very well equipped, I trained him up on the band saw and other machinery and he got to work finishing some fine woodwork projects as well. For the first time him and I had truly bonded as brothers might and I was choked up more than a couple of times with pride for the young guy and sadness that my/our Dad couldn’t be there to join in with us. The boy had shown excellent initiative and creativity as well as capabilities in research , organisation, saftey and finishing projects, one after the other, never forgetting that the job is not finished until the tools are put away. Men’s shed have Govt funding in Aussie and what an amazing resource this shed and its men and its tools and machinery were to us. The closer I became with the boy the more I questioned his parents decision to never be honest with him. Their decision meant we all must live in the lie. The man he was told was his dad was dead, and his real father lived somewhere in the same town apparently. Still his Mum was insisting that it wasn’t the right time to reveal the secret that everyone except the young man knew. Again I pressed the issue to his Mum telling her the boy, now 24, – deserves the truth. She agreed but claimed the boy was doing so well she didn’t want to upset him, She had written In her will- a note for her older daughter to decide if and when to tell him should she pass on. She claims the unsavoury character of the boys biological father would not be well appreciated by the boy. She also admits that she expects the boy would be displeased with her for a lifetime of dishonesty. This year we will have a family get together to remember my Dad and his brother who passed on a couple of years after him. Since Discovering Menz site a few years ago and reading through the writings on the topic by thoughtful men (particularly the great DJ Ward ) I have been enlightened and shocked at how common paternity issues are for us. If I read correctly, someone estimated that this could be a one in three chance. That one in three of us either believe someone is their father that isn’t or that they believe they have a daughter or son that isn’t biologically their offspring? I want to spill the beans, I want to give my brother the truth, I realise this will likely make me despised perhaps for many years by other family members particularly the women who claim to always know what’s best for everyone. I’m unsure if the man even knows he has a child at all. Any failing the boy succumbs to in future will be likely be laid at my feet forever. The family gathering in remembrance of my father would probably not be the right time, but when and how I’m not sure. So I’m hoping some advice from Men I’ve never met but who’s thoughts I value like DJ and Man X and all you others might help me decide what to do. Or perhaps the guy who lives three houses away … ? More importantly I am amazed at your input in your step brother’s life as well as your concerns for him. I wish I could offer advice but it sounds like you have already stepped in his father’s shoes in replacement for your own father – And it seems he was a great man. It seems also you are perfectly capable to assist your brother in the next journeys in his life. 21 years apart makes you a surrogate father for him. As far as for telling the truth, whatever you decide, know that you must be around if this truth makes him reach for the deep end. Often we confuse our load with other’s and discharging of them may make us feel better but the agony it will create for another cannot be measured. And often we confuse the fear we have of being judged (for hiding a truth otherwise inconvenient) with the best interest of the person for whom you hold concerns. I think the key person to speak to is his mother and seek to understand her motivations for not telling him. Without knowing them, I fear you have no idea why both your father and his wife chose that path. And I assume they know best. If she passes too and the matter is not revealed, is it likely for it to be ever revealed to him? Please forgive my impertinence in responding when you probably seek other’s specific input. These situations many years ago were much more common. I’ve seen people hurt by the secrecy. First to scene of an attempted suicide in one sad case, which although I urged the parties involved to swallow their pride and tell the truth, it still hasn’t happened. Adults, up to a 50 year old man, dealing with his part Maori, adoptive history. These situations are out there, but I’ve never been in your shoes, where it has been part of my family. Having said that, I have come to the conclusion that each individual is entitled to their truth, with maybe the odd exception, but that should not be based on other people’s selfish motivations. It’s possible reading through your story, that the father and child never bonded as such, and for that reason became closer to you as a father figure. For the people I do know living with a lie, I’ve seen some sad outcomes, both in health and emotionally. Is the truth most distructive, to the person who started the lie? Perhaps not always, but it’s a good motivation to continue the secret. I’ve seen that go both ways, but those involved then deal with those issues whether they like that reality or not. I’ve been there once myself, in a similar situation, and I ended up with a woman screaming down the phone at me. It was a temporary reaction, and it all worked out for the best in end. But sadly there are some other lies I’m still watching from a distance. I think that whatever happens that he should finish university first. The last thing you would want is for him to go feral and not finish. Unlikely but possible. This scenario is probably quite common so your not alone in having to deal with this issue. The most important step is to establish who the father is. While your brother finishes Uni you can do some investigating yourself. It’s possible but unlikely that this man does not know he is a father. You may find the mothers story is correct and he has a rap sheet as long as your arm. It is even possible that he is a normal Joe blogs with a family, Ie brothers and sisters he doesn’t know he has. Fingers crossed he’s not going out with a long lost cousin. He could even be an extremely successful man. Why did the mother do what she did? He may be a monster that shouldn’t be anywhere near children and not naming him prevented access. She may have tried to stich him up but he and possibly his family rejected her, hence the vindictive tone. He made it clear he would go for custody but didn’t want her so she excluded him, protecting her relationship with your brother. He was low income and just said not interested, please have an abortion resulting in a big argument etc. The reality is you will not know the truth whatever it is until you ask the father his side of the story. In my mind, if the mother has nothing to hide then she should be open to a plan to address this issue. Generally those issues with the passage of time fit into the who cares department but it can be hard for the person to see that and they try to protect themselves from irrational fears. Passing the decision on when she dies just means it will never be resolved, and he may also never get to meet his real father. My mother was 40 when a women knocked on the door and said “Hello I’m your sister”. Four more sisters later and a realistic picture of her mothers life was revealed, analysed, and accepted. Forced adoption plus no contraception equals. He deserves to know the truth. PS it cracks me up that all the women thought it was OK. Those statistics make those family gathering quite frightening but no worries. If nobody knows the secret then it’s like a tree falling in a forest with nobody to witness it. Heh bother I bought you this family DNA ancestry kit for Christmas. I bet your mum will think it’s fantastic. IE nobody notices the tree fall down but you can visit the forest to see it has fallen. The mother needs a justification to defend her decision. You can bet there is another woman who would say the same man (ie the father) is an absolute angel. Perhaps the real father is a rough character and a pregnant woman found a sympathetic older man with enough money and probably a few brains to boot to hook up with. Is that really just an unofficial secret-adoption arranged by a scheming woman? How does it work now? Remembering back to perhaps a more honest time, when a young pregnant woman married another man, he could adopt the child after the marriage and become a legal guardian. Was the step father a covert choice of legal guardian, which effectively excluded the real father and made the step father a non-effectual legal guardian. Could this have been about a woman manipulating sole guardianship? my mind has searched for reasons to questions not yet prompted, and others nothing more than frustrations to bewilderment at what is best. What if the boy should have health issues and his doctor asks to know of his family history of illness? Then there’s the issue of genealogy, we have had our family history traced in recent years but no one sent the young man a copy. How should we respond if his descendants inquire, should we mislead them too, at what point do we become deplorably dishonest to be unforgiven. I have pondered upon the years gone by also, would the boys cousins and uncles and aunts and all his other thought to be relations have been closer and had easier connections with him if they weren’t expected to hide a sacred secret. He could have been our gifted family member and appreciated that way. And that’s just my family, what siblings might the boy have, what cousins and uncles and aunts and grandparents might he enjoy if he was told the truth? But I understand that Id do well to examine my intent before choosing to be a boat rocker, bean spiller and a do- gooder. Firstly, I’m not there for him in this regard, We live in different countries and I would have to leave him cold, And secondly, yes perhaps its true that to tell him the truth would satisfy my self more than him. I would feel justified and righteous but without knowledge of the end result-, should it be my call? My Father made a decision, he was no saint- but he has chosen much wiser than me about so many things, and his wife,- the boys mother, is virtually otherwise unfaultable as a parent to the boy and also as a companion to my father, to this day, their home is a shrine to all the things they achieved together. His ashes remain there with her- regardless of protocol, to his honour. Perhaps I will ask my step sister and share with her my thoughts of indignation of the situation. Thanks fella’s, This for me needed a dose of DJ’s thousand island dressing of perspective into the realms of the possibilities and unknowns, also Downunder and Evans thoughts appreciated. There is no easy answer here, but a decision that you have had forced upon you, by others actions. I see that you recognise an obligation to the truth. Do what you feel is right. Regardless of the outcome, you will never know how bad the alternative could have been. in my experience there is never any excuse for Lying. tv & movies also agree with me. Only scum (child kidnappers (pedophiles), narcissists & psychopaths) Lie. and they do it not to ‘protect the person they are Lying to, but to protect themselves from any perceived fallout they may recieve from the consequences of the truth or the consequences of their Lying to someone they claim to Love or Like. I had a close friend who was adopted as a child with no knowledge of his paternity. He just did ancestry DNA and discovered his mother and close family. My guess is the mother in the hope she may find her lost son submitted DNA as well. He hasn’t tried to contact her because he thinks she should contact him. Interesting to see who makes the first move to contact. Probably quite a difficult thing to deal with as he’s early 30s. Gone up North for a holiday – away having a baby (possibly being adopted). With the number of adoptions, it’s not an unfamiliar situation. In two situations I am aware of, the first was a successful expedition, the second not so good, as the mother’s later family including her husband, knew nothing of the adopted child. (i)	Your ‘brother’ probably has been aware that he doesn’t seem to be like his father, and he may well have wondered about his paternity. It’s likely he will find out one way or the other so would that be better to come from someone who loves him? (ii)	You have never given an informed undertaking to maintain the lie so you do not need to confuse your decision with any such imagined commitment. You know the mother’s preference for what it’s worth, but the burden of the secret has been placed on your shoulders without your consent. It’s morally your decision, not hers or the family’s, what you do with that burden. (iii)	The idea that the mother can or should control others’ management of the secret, even beyond her death by dictating who will inform the boy, is an invalid assumption. (iv)	Your decision is a difficult one and it’s reassuring and commendable that you are considering the pros and cons, the possible consequences either way, and prioritizing your concern for the boy’s well-being. Give yourself the right to make that decision according to your own best judgment. (vi)	The way he’s informed will be important. If it’s from someone who seeks mainly to defend the mother’s and the family’s honour etc, that may crash his world and trust more than if it’s from someone who can understand and be with his emotions and thoughts when he finds out. You may be the best person to tell him and no doubt you will explain the difficulty of the position you and everyone faced in dealing with the situation. Of course, this may include discussion of the mother’s decision in the context of attitudes at the time of his birth and childhood, and the extent to which the mother thought she was doing the best for the child. (vii)	Should you decide to rescue him from being “an unknowing fool”, it will be important to do everything you can to be as considerate and caring as possible to all concerned. That may include telling your mother and other family members beforehand that you are going to tell him, explaining your reasons. Perhaps ask if they are willing to invite him to talk to them about it after you inform him, or to have a family meeting with him to discuss the matter after he’s told. But your efforts are all that you can be responsible for. Their reactions and opinions are not your responsibility. Focus only on what you realistically can do and take responsibility for only that. (viii)	You can offer a choice to your mother or others to tell him before you do, if you decide that might be in his best interests (or for any other reason). However if you decide that you would be the best person to tell him and you inform the family of this, then don’t leave significant time between those communications. For example, tell family members in the morning then tell him in the afternoon. Otherwise, it’s predictable that other family members will try to get in first, without thinking it through, and that may become messy and unhelpful for him. “An unknowing fool” is quoted from the lyrics of Joan Armatrading’s song ‘The Weakness In Me”. I have reread your post and realized I have possibly given you bad advice in so far as suggesting that the most important person to speak to is your step mom. Forgive the word “step” as it is used for orphans. But now it is part of the common language. You mention having a half sister from the same woman about your age. I knew the woman or knew of her as she had a daughter my age that I’d partied with a few times. This means she most likely knows first hand whom the father is. You also mention the decision relies on her to tell your brother or not. You also mention the fact that their decision to withhold the truth is one you disagree with and you provided ample valid reasons for the truth to be told. Their decision meant we all must live in the lie. After re reading you original post, the woman in me started to read in between the lines and I can feel a lot of frustration coming from you from this situation. I accepted at first it was to due with the burden of the secret you carry. But in truth you carry none of it. It is your step/half/sister that carries this burden. This essentially protects you from having to make any decision in that regard. Considering your inner conflict still with this situation. I cannot help but wish to ask what is the nature of your feelings for your half sister? This is not a question for you to answer here… but was raised by your comment as below. Because this secret makes sure any passion you might hold/express for your half sister, if any; will be deemed incestuous by everyone in the family.